This week, Betsoft was thrilled to report that Max Quest: Wrath of Ra slot has been shortlisted for a coveted international igaming industry award. Betsoft was informed that it is line, with another 11 of the best online casino slot games, to win the exclusive Spinnovator of the Year annual award. The awards will take place at the end of April in Prague, Czech Republic at the Spinnovation Summit. This annual get-together feature keynote speakers from across the industry. Participants from near and far will get together to view the online gambling’s most innovative games that were handpicked by a panel. The games represent the very best of what the industry has to offer, with the slots carrying the most outstanding features, the most inventive game mechanics and the most original themes. Betsoft’s Max Quest: Wrath of Ra is a fine example of a game that meets all these and more. 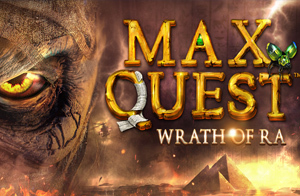 Max Quest: Wrath of Ra slot was launched last year and it is said that the game reinvented the traditional RNG slot. The interactive adventure slot blows new life into the Ancient Egyptian theme – a multiplayer experience, teaming players of up to six in a group and encouraging cooperation, competition and customized gaming. Create your own avatar and then progress through this game to grab top rewards.